Bienvenue! Laissez les bon temps rouler!!! I’ve been busy all morning preparing a slightly more formal table than the way we celebrated over the weekend. The same amount of debauchery, however, is expected as for any Mardi Gras celebration! I elected to allow the natural wood of the dining table anchor the setting. Over the bare wood I crisscrossed lengths of shimmering purple, green & gold netting. Each place setting started with a deep purple cobbled charger from Burlington. The china was purchased several years ago at Pier 1. Add gold toned flatware and my trusty Godinger “Chelsea” collection stemware. Purple gemstone napkin rings from Z Gallerie hug the sheer organza Pier 1 napkins. Here you are better able to see the cobbled texture of the chargers. The centerpiece is made up of several pieces. First, in a Godinger “Dublin” hurricane, is a mass of free-flowing fresh greenery. I wanted a kind of “messy” look to play off of the more formally arranged carnations beneath it. Clusters of beautifully fragrant royal purple carnations rest in diminiutive crystal vases. At each end of the dining table are Godinger “Dublin” cut crystal candle holders. 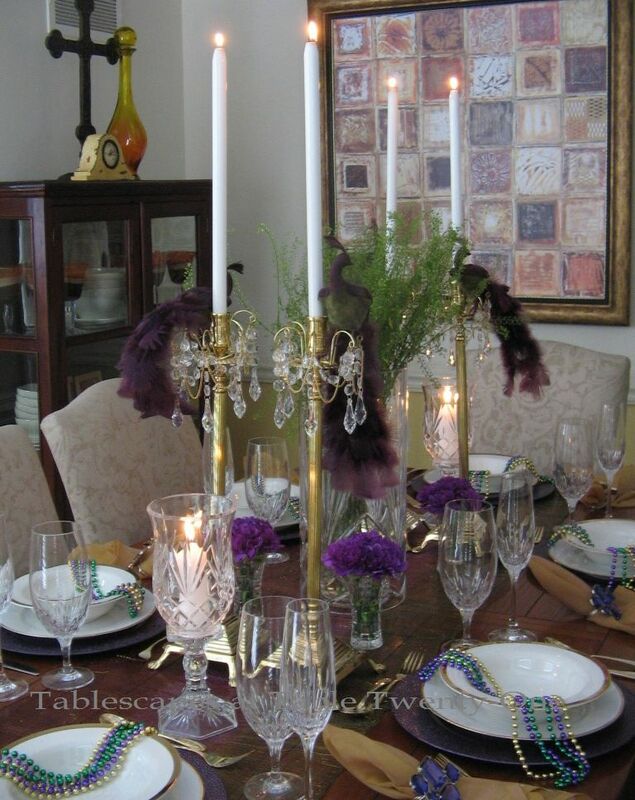 Graceful purple birds with soft green bellies and long, sweeping tails perch high above each gold candlestick. The birds were purchased wholesale many years ago, but this is the first time I’ve had an opportunity to use them. One of my favorite parts of decorating is the chance to create something new by combining various elements. The very boxy gold-toned candlesticks are softened by the addition of these bobeches dripping in crystals. The buffet area is the perfect place to extend the festivities from the dining table. Purple, green & gold mirror balls stretch the length of the buffet with a strand of the same colored beaded garland. On one end of the buffet, a Harlequin doll stands guard over the assorted candies in cut crystal containers. On the opposite end, a mini bar of soul-satisfying bourbon, scotch and brandy in cut crystal vessels awaits thirsty guests along with fun feathered masks. I don’t much care for store-bought King’s cake, so I am substituting these lucious homebaked cinnamon rolls. The smell of cinnamon wafting through the house is wonderful!!! This Beverly Clark cake server with the regal crown on the end is the perfect utensil for cutting and serving the King’s cake! I didn’t create menu cards for our buffet this evening, but we will dine on a traditional gumbo starter followed by fried catfish, red beans & rice, candied sweet potatoes, collard greens and cornbread. After all, that’s what Fat Tuesday is all about! I wish you and yours a joyous and festive one! In the browsing mood? I hope you will take the time to visit Susan and the other tablescapers at Between Naps on the Porch for Tablescape Thursday! You table is by far regal and elegant. Each chosen piece blends perfectly with the next creating the magic that is Mardi Gras. I love the idea of the woven pieces on the table. amazingly clever. I used some bobeches similar to your, but not even at nice. but I think I’ll find some crystals to hang from them! You inspire me each time i visit. Your crystal candle holders are lovely and the birds, well they stole my heart.. Great table Alycia. great table. Thank you, Marlis! I had to go ahead and post early today while I had the time. I’ll be up to my elbows later tonight :-), and then I will be out tomorrow setting up a table at a local venue. I’ll just post when I can for TT. I see we used the same title for our posts! Cool!!! Great minds think alike! 🙂 Gotta run…2 more bathrooms to clean! Talk to you later! This looks AMAZING! I don’t think there’s any possible way a guest (or host) at this table could NOT have an absolute, total blast! I love it all, but I was fascinated with the closeup of the tabletop showing through the colorful layers of netting — so clever! Thank you for your visit and the wonderful comment you left. Your comments always make me smile (some make me laugh right out loud, so I try not to be sipping coffee as I read them!). I totally forgot you asked me about the pecan pie recipe a while back. I’m not sure what the cornmeal does, but I think it makes it a little less “syrupy.” Sweet, but not gooey/runny. Maybe it turns it into sort of a cross between a pecan and a chess pie. Anyway, have a great Mardi Gras celebration! Oooh! I love the jeweled napkin rings! Also the fantastic peacocks. Stunning, whimsical and fun…all rolled into one beautiful tablescape! I love it. Beautiful and fun Mardi Gras table Alycia! Love it!! What a pretty table and buffet! Love the colors, love the candelabra – nicely done. Just beautiful! Invite me next year! Love the napkin rings. Oh fun — not one but TWO Mardi Gras tables to enjoy! I that your butler got into the fun as well. Beautiful birds….so many wonderful elements of creativity! Gorgeous!The purple carnations, and the peacock are stunning! Alycia…this is so beautiful and looks like a great Mardi Gras party time! You’ve used those Mardi Gras colors perfectly!! Thanks so much, Tess! I’m all partied out now! But I’m still hungry. Why, oh why did I pledge to exercise during Lent??!?!?!!! Your table looks so elegant! Beautifully done. Thank you so much, Jocelyn! I appreciate it! I hope you have recovered from your own Mardi Gras celebrations! Have a wonderful weekend! Hello Alycia! How fun is this!!! Gosh, I don’t know where to start, so many things I just love in this post. First of all, love the butler all dolled up for the festivities. I’ve always thought I might like a similar one, I’ve just never come across one (that I could afford at the time). The chargers are great and you know I love those “Chelsea” stems (I’m going to be picking up more of those if they still have them), and the candleholder globes look awesome. I really love those birds, not sure what type of bird they are, but the tails look so majestic! Bobeches are on my list of favorite things, these are fantastic, and the free-flowing greens with the more structured purple flowers work so well together. Great vignette on the sideboard, too! Rolls look so yummy, and your menu does too!! All in all, another great design!! Keep em comin’, my friend!! Fabulous! A Mardi Gras table at its finest! I don’t think I have ever seen purple carnations, how great is that! You know….now that I think about it, I’ve only recently seen purple carnations myself. I bought some back in December or January, and then again last week. Both times they were the most brilliant hue of purple…I couldn’t resist! I wonder if God makes ’em in a raspberry tone? 🙂 I hope you have a good weekend. I’m looking forward to a restful one myself! See ya next week! Oh my, that purple just delivers a punch to everything! Absolutely beautiful! LOVE, the butler!! ha ha. I really liked how you used the Mardi Gras colors on such an elegant table. IT was fun, yet sophisticated all at once. Great table. Thank your for sharing! Absolutely gorgeos and festive…you want to have a party as soon as you see this table, just terrific! I love the purple carnations, very different, I don’t think I’ve seen them before. Well Alycia, you’re a very talented lady, not only do we have one table to enjoy, but two! Thank you for sharing. 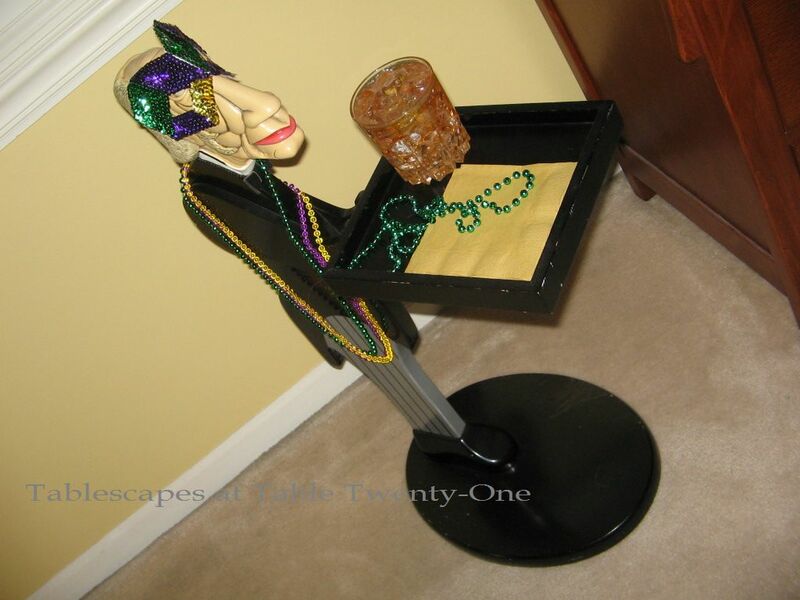 This is a beautiful Mardi Gras table!!! It is so colorful, regal, and festive. The Beverly Clark cake cutter is the perfect touch. I just love the little crown on the end of the handle! You have such a pretty dining room. If nothing goes wrong, I plan to have a St. Patrick’s Day table for next Thursday’s TT. 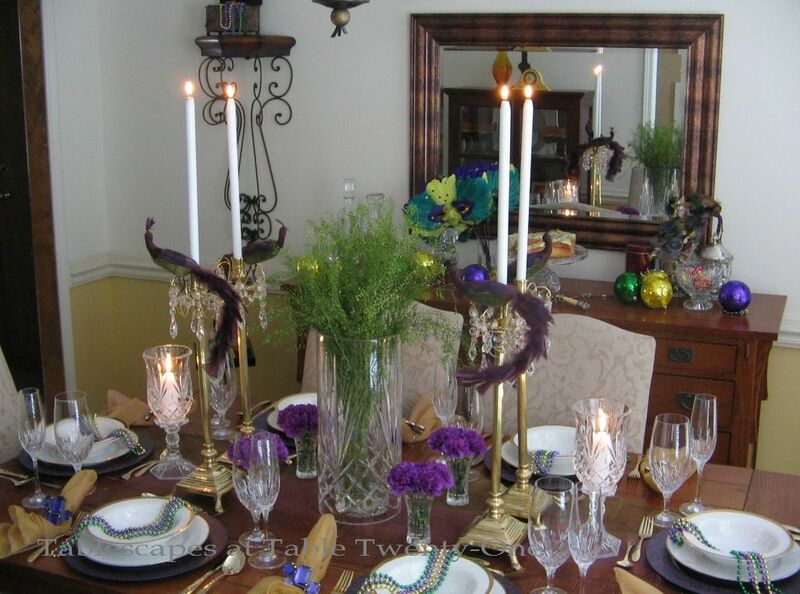 Sorry I am so late this week, Alycia…beautiful Mardi Gras table, so elegant. Love the gemstone napkin rings. Not much I can say that hasn’t been mentioned. I do like the bold touches of turquoise thrown in with the traditional Mardi Gras colors. And I notice you are the featured blog….not bad! Hi, Linda! Thanks! I’m glad you like it. Have you “sprung forward” yet? I am dragging becasue of it. Not sure why it affected me that way this year. It usually doesn’t. I think my husband’s griping about losing an hour has something to do with it! 🙂 What do you mean about the featured blog? I was #4 this week. I’m pretty sure The Tablescaper made it to the #1 spot this week. Or are we talking about something different? I love your elegant Mardi Gras table. Sheer gold organza napkins, gemstone napkin rings, gold rimmed china, crystal candlesticks with glowing candles and crystal vases filled with greenery flanked by glamorous peacocks all spell ELEGANCE! Purple carnations top off the colors of Mardi Gras. Now, you have a sideboard full of pretties too. Substitute kings cake with the cute server with a crown is perfect for your theme. Your menu sounds delicious. Wow! Ok, I just realized this was a past post but I enjoyed it and didn’t want my comment not to be read. Oh wow, I wasn’t blogging back at 08, so I’m so glad you reposted this master piece setting for Mardi Gras! Stunning! I wanted to attempt at making a table for this occasion even though we even have been enjoying Carnival long weekend, today is our last day! You have inspired me, so I will never miss it again! How are you pretty girl? I hope you’re all well by now, sweetie! Alycia!!! I love it!!! This really is perfection. I adore those tall brass tapers. Wow! And the purple flowers are the perfect touch of royal. You did it again, my friend. Lovely as usual!